Join this fun class to learn how to oil paint in a close knit environment. This beginning and intermediate course will strengthen your knowledge on the basics of application and the mixing of colors, in addition to learning many helpful economical hints. The inability to draw will not hinder you in this class. Each student selects their own subject matter to paint. 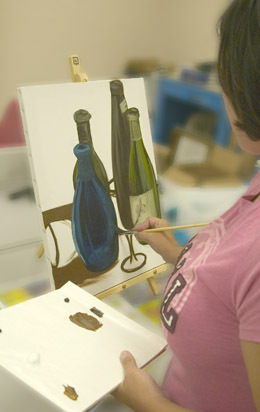 Call instructor at 702-361-7873 for basic supplies and size limitations of canvases. Please read: Bring to class: 16 x 20 inches or 9 x 12 inches stretched canvas. We will go over supplies first day of class. Please bring an apron or wear old clothes to paint.